← Alberta Flood 2013: Redford Promises “Whatever It Takes.” Uh Oh. The RCMP is acting like an occupying army in High River. Governments invariably use emergencies to extend their powers and subject the citizenry to greater abuse. Natural disasters are no exception. High River was devastated by the flood. The entire town was evacuated. It has been eight days since residents were forced from their home. As the waters recede, people want to return home and see the status of their property. “No way,” says the RCMP. High River is effectively under a state of martial law so intense the citizens cannot even enter the town at all. The RCMP set up a roadblock with 30 officers to prevent residents from entering. Dozens of police cars with flashing lights lined the streets menacingly. A spike strip was deployed to cripple the vehicle of any outlaw who dared to enter the town. But it is not enough for the RCMP to use threats of violence to keep out residents. Some High River residents have firearms in their home, you see. So those homes had to be invaded, and the firearms had to be confiscated. “People have a significant amount of money invested in firearms … so we put them in a place that we control and that they’re safe,” said one RCMP sergeant. Oh. They are taking guns to do those owners a favor. See? No problem. “It’s like Nazi Germany,” says a resident. Yes, it is sort of like that. It’s also sort of like New Orleans and Hurricane Katrina. FEMA confiscated civilian firearms during that disaster in the name of “safety.” That’s the real template for what’s going on here. This kind of behavior by the RCMP was entirely predictable because of the lessons of Katrina. Memories of the scandals surrounding FEMA’s gross incompetence during Hurricane Katrina’s aftermath informed us how big, bureaucratic government agencies with police powers behave during emergencies. 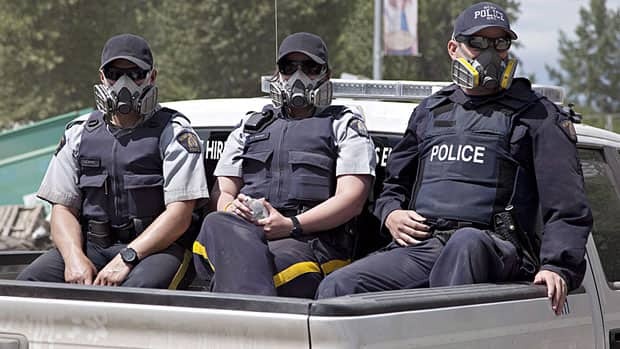 The RCMP is not particularly less malevolent just because they have funny uniforms. Based on their actions, every level of government involved in the Alberta floods seems desperate to be as incompetent and harmful as FEMA. Premier Redford defended the actions of the RCMP. “I really hope that we can focus on more important matters at hand, like getting 12,000 people back into High River than continue to circulate this story,” she said. She seems to overlook that the government has utterly failed in High River. The more they focus on getting High River residents back to their homes, the longer it is likely to take. When will residents be able to return home? The RCMP tells us: “People much higher up are going to make those decisions.” That sounds efficient. The mayor of High River says no one can return home until Home Hardware and Shoppers Drug Mart are open. In a rare moment of sanity, the Prime Minister’s Office said the RCMP should return the guns. By this I think they mean, “Make it possible in theory for the owners to get the guns back.” Since the Minister of Public Safety is in charge of the RCMP, the Prime Minister can essentially just order the RCMP to return the guns immediately. Yet this has not been done. But the RCMP never claimed it would keep the guns forever. They’ve maintained the pretense that the guns will be returned. But it’s unlikely that process will be easy. Will every owner get their guns back? These are the guys the RCMP is so afraid of? If I recall correctly this was done in the aftermath of Hurricane Katrine here in the United States. Not a problem if Military, as it was in the case of Katrina, or Law Enforcement are going to stand guard and protect. The confiscations were even conducted in rural areas and after the search and seizure the home owners were left with no protection from looters or robbers or otherwise. It is really work to do for life. The word on the street, though not the High River streets which are …. RCMP could invade homes, rip through the houses, and seize every gun. I can help my near site form overcome the problem. I really think that the rcmp has overstepped its boundaries by taking guns out of peoples houses. If they had the safety of the public in mind,they should have taken all the sharp cutlery and other objects that could harm a person. They took the liberty to break into peoples houses ,many times destroying the front doors, windows and frames. That way, they left the houses even more vulnurable for looters, animals and the dirt to come in. Also, they totally contridicted themselves by taking the guns away,because they actually state that they cannot protect your house against looters thus,they are not doing their job. I think that everybody should get every gun or rifle back. If the rcmp would have done their homework,they would have had a list of what gun they got from what house. If there would have been no time to do that, that would tell me right away that the rcmp should have been right at a place where they could heave done the job they would have been hired for:serving the public. I think this shows how the rcmp functiones under pressure in this particular crisis situation. To me it looks more like a police state situation.